There is an overall shortage of Southeast Asian cuisine in New York City, and even when you find it, nothing will be guaranteed tasty. Our Cambodian and Myanma chefs have moved on. Our Vietnamese restaurants are flat. 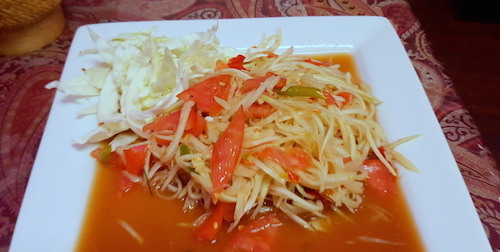 Thai food is having somewhat of a renaissance, but is in pockets, sometimes far away. There is one Lao chef who has served exciting cuisine in Tribeca for some years, but even she has left her restaurant to others and the results show. 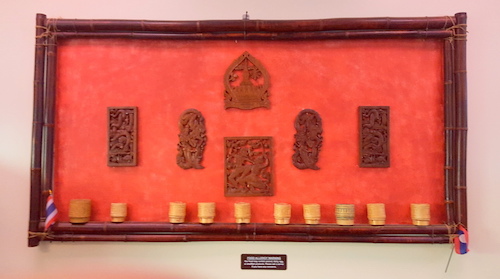 On the Lao side of the restaurant, an homage to sticky rice. 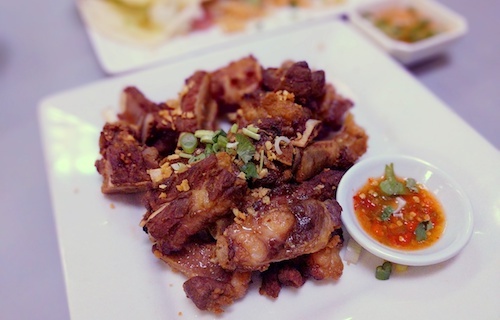 When traveling in Laos, it is hard to avoid the similarities and influence from Vietnam in their cuisine. Many Vietnamese people live in Laos, and have for generations. 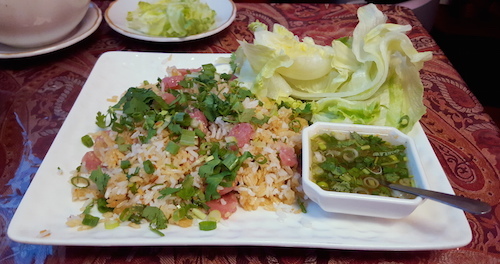 One such dish was the Lao fresh rolls ($7, below), arriving just like any pair of gỏi cuốn. The sweet fish sauce is the only big difference, but even this can be found depending on taste of the individual. Here even pretty late into the evening on a Sunday, my fresh rolls were indeed still fresh, with just a hint of chewiness from the wrapper. On this night, there were not many others dining and I had the attention of my soft-spoken Vietnamese waitress and even the chef at times would come out to check on everyone, welcoming her regulars with hugs. While discussing my options, they talked about the special Lao soup ($16, below), and it seemed my waitress gave some information she was not supposed to. While shaking her head, the chef said only one was left, and then of course I had to ask if I could have it. 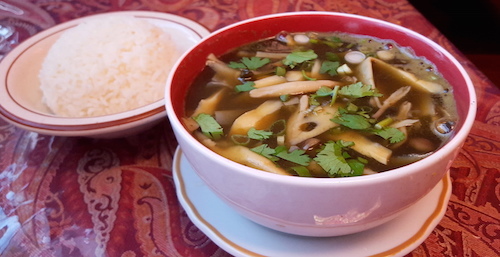 It was a marvelously tangy sour broth with a lot of bamboo and mushroom. It comes with a small bowl of rice that I was encouraged to eat with it, but I had decided to order five items and was alone on this evening, so I left my stomach for other battles. The broth gets your tastebuds working, the spiciness starts, and of course it is so hot when served that it cannot be gulped down by any means. The best larb I had in Laos came from a window of someone's home in a residential neighborhood, a proprietor who decided to make her home cooking available to neighbors. Ordering a portion was a massive affair, not only was the larb itself given, but a vast array of vegetables and a good hunk of sticky rice, all of which was certainly not already prepared for takeout. After waiting and collecting the feast, you find somewhere to sit down and eat it, scooping up the delicious meats and intestines with the rice by hand, pausing for fresh greens throughout. It is a thoroughly fresh and spicy affair which unfortunately is not replicated here in the states, at least on the east coast. 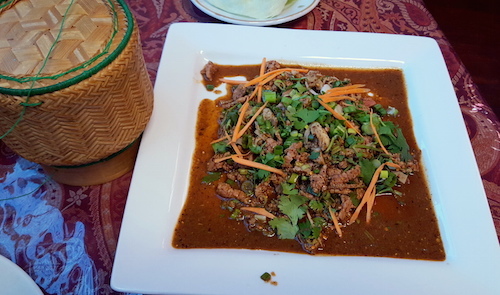 My larb nuer ($16, below) comes as close as possible to that enjoyment. Carefully cut beef and tripe, a gaggle of spices and herbs, and the "homemade sauce" are all right on point. The basket to the left of the dish holds the sticky rice that is served with it, and really the only way to get the whole experience. A note about their spice-level system. A dry erase board warns customers that their levels are "four times" the normal levels (for Maywood, New Jersey? ), making a "1" equal a "4" and a "5" equal a "20". They seem uninterested in making mild flavors when dishes are not supposed to be mild. I overheard them refuse to make someone's larb "without any spice" as she requested. This is a good thing for sure. My level was 3, and indeed it probably was around a 12... about as high as the heat levels in Queens Thai restaurants will go. But at least for larb, this is the way the food is supposed to be eaten. I was very thankful therefore to have ordered the nam kow ($14, below), a simple street food that has no heat and offered my mouth a break when needed. Little balls of rice are fried until crispy, and mixed with fermented pork, creating what could be a Lao bar snack. I was especially sad at the BYOB nature of the restaurant while eating this dish, as a cold beer would have been perfect. For anyone wanting to bring alcohol, it would be wise to get it before coming as there is nothing nearby, especially for those without transportation. I could barely muster the strength to have even a few bites of my som tum poo ($16, below), the green papaya salad with a puree of crab anchovies. This was also heavy on the heat as expected, but seemed to be unusually drowning in the thin tomato sauce. I enjoyed this more later when my stomach opened up again the next day, but if there was a dish of the lot I would not order again, it would be this one. After the starters, the menu is divided into convenient pages, one for Thai and one for Lao, making your decisions very easy. Vote straight down the party line, or a mixture of the two. 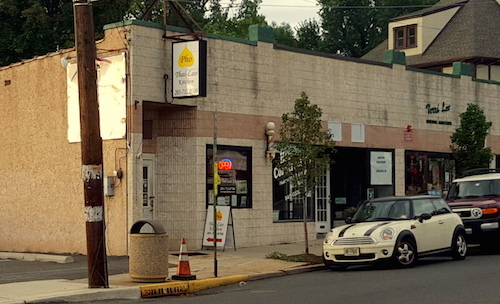 Either way, Maywood, New Jersey is an exciting place to go for the fiery foods northeast Thailand and Laos.